un expresses “serious concern” over human rights in iran | doberman pizza. 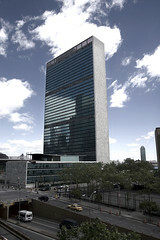 UNITED NATIONS, 22 November 2006 (BWNS) — A committee of the United Nations General Assembly yesterday passed a resolution expressing “serious concern” over the human rights situation in Iran, including the escalation of violations against Iranian Baha’is. The resolution passed the Assembly’s Third Committee by a vote of 70 to 48 on 21 November 2006. It will now go to the General Assembly plenary for vote, in December. The Third Committee considers human rights issues for the Assembly. The resolution also expresses concern over the “destruction of sites of religious importance” to Baha’is and “the suspension of social, educational and community-related activities and the denial of access to higher education, employment, pensions, adequate housing and other benefits” for Baha’is. This entry was posted in baha'i blog, by the way... and tagged human rights, iran, news, united nations by danger. Bookmark the permalink.